Wedding Photography and Video : What to Pack? I occasionally get asked by other photographers what kind of equipment I shoot weddings with. I wish there was a single 'right' answer for that, but truth is, it really depends on a number of variables. Do I need air travel to get there? Is it a full day? Do I shoot photo and video or just photo or just video? Is it an indoor ceremony or an outdoor ceremony? and the list goes on. 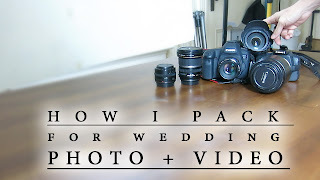 With the wedding I shot this last week, I decided to a little 'unpacking' video of my gear to show you all what comes along with me. Packing well for a wedding, to me, means that a) at no point I was looking for a piece I didn't have and b) I used everything or almost everything I brought. I don't like to pack 'the kitchen sink' because if I have tools I don't need, they just get in my way when I am trying to find the tools I want to use - for this reason, I pack only exactly what I intend to use. From this last wedding, one of the only things I didn't use was the E-TTL cord to get the flash off of the camera and a 28mm f/2.8 prime lens. To some, it may look like I am packing the kitchen sink - especially depending on how big your kit of gear is. Truth is, I have a reason for each piece, and each piece is there to help me pull off a specific style, shot or look to my images. I pack in a way that I consider the time of the day I will be using the equipment. I don't just put all the photo stuff in one big duffel bag and work from that all day - I have a small side bag that holds my main stuff (flash batteries, memory cards, QR plates, optical filters, etc) because I am going to need into that bag more frequently than the one that holds my umbrella mounts for the light stand, or the gopro accessories, etc. So pack for the day - how do you intend to shoot the morning / prep hours? Keep that all together. How to do you plan to shoot the ceremony? What will be used for the first time when shooting the ceremony? Keep all that together, and so on and so forth. The last thing you want to do is miss a shot because you were too busy getting elbow deep looking for something in a duffel bag.